I wanted something stylish but also cheap. 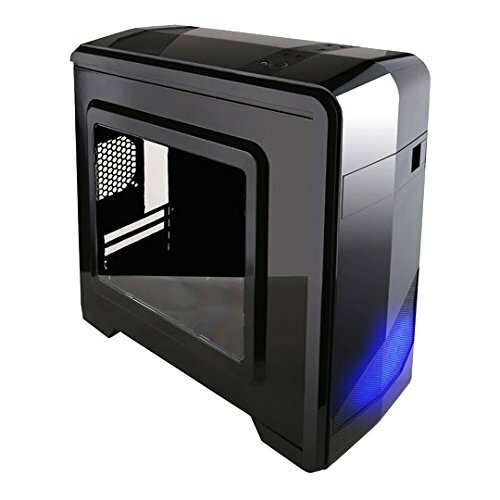 This is a black mid tower case with blue lights coming out the front fan. Very nice looking and sleek with its see-through side panel. Very easy to work in, only complaint was with the orientation of my PSU, I would have liked it to be able to flip it upside down for better fan flow, but would not line up with the screws right. Overall, a very nice case. 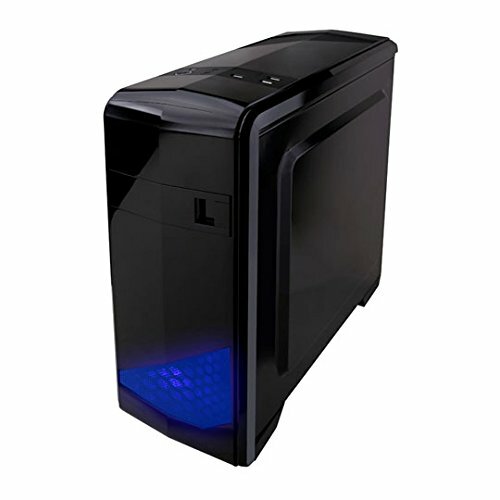 It's sleek, it's got a nice blue LED fan pre-installed, it has the front panel placed on top rather than in-front, and it's got a see-through side panel. The only things I'm not a fan of is that one of the legs keeps coming off, and both of the side panels are EXTREMELY difficult to "break in" the first time. They're much easier to remove after the first few times, however. The PSU holes are a little difficult to align, and the non-replaceable expansion slot thing irks me a little. It's also slightly cramped overall, but hey - make do with what you got! Also, it's a bit of a fingerprint magnet, so watch out. The case... 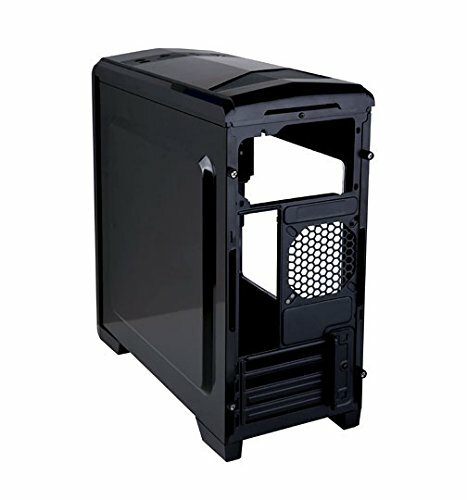 I wanted to stick with a smaller form factor for my computer and began my search for a mATX case. This case was amazingly cheap and looks great to me. It even comes with a window in the side panel. 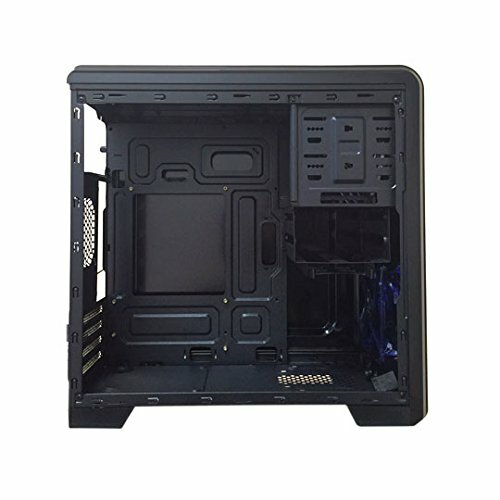 For a mATX case, Apevia has done a great job, giving you lots of room if you have an enormous graphics card. 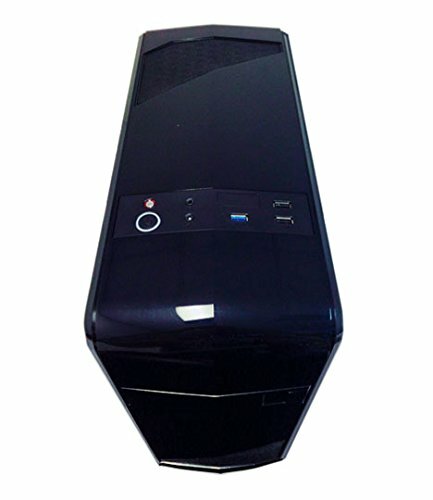 It can also take several hard drives and a 5.25 inch drive in a couple different configurations, to meet your needs. That being said, there are some things that I didn't like so much about this case. Apevia give ample room in the case for components, but contrary to their description, cable management is a nightmare. A NIGHTMARE! They were nice enough to have a few cutouts to run the cabling through, but between the wall the motherboard is mounted on and the side panel of the case, there is maybe half and inch of clearance to squeeze all those cables into. This is where a fully-modular PSU would've been great. Although I tried to use only what I needed, there were still a few extraneous, leftover cables hanging out. Another thing that gave me difficulty was the wiring from the front panel. The power button and USB inputs are placed on the top of the case, which makes sense in terms of ease of use, but for wiring, that proved troublesome. The mobo header for the HD Audio was on the opposite corner of the case and the only way the connector could make it was directly across the inside of the case. This issue may have just from the combination of mobo and case, but a slightly longer wire wouldn't have hurt. Another interesting thing I noticed is that the top fan mount is located smack dab in the middle of the top of the case. There's a mesh vent on the top, which is identical to the one on the front to show off the glow of the fan, but the top vent doesn't line up with the top fan mount... And this may be my fault for picking a small case, but my PSU was slightly too long, so it prevented me from installing my second fan anyhow.